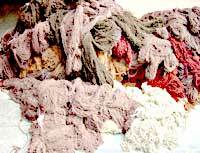 The wool that is taken from the lambs and spun in factories and hands is dyed with chemical and natural colors at the dyeing units as per the required shades of the rug in weaving. 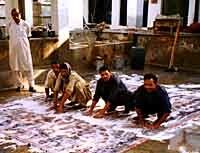 Before every carpet in put to the handloom the designers (artists) make the graph and taalim work of the carpet according to its warp and weft quality. Every small block of the graph paper depicts on knot and the designer has to take care of every small block's color, its curvature so that the overall impact of the carpet should not loose. The colors used are water colors on the graph and the total graph is laminated to be served to the weaver on the loom. In single knot (senneh knot) the graph is the main source of the weaver but in the Persian knots (double knot weaving) the TAALIM is used. Taalim is basically a language of impressions drawn on the paper in horizontal pattern, each denoting a color and its number of knots. The whole carpet is written in horizontal taalim words and the master weaver loudly reads the language and the hands follow the knots.Its something strange and treat to watch how magical the weavers understand the language and turn it into piece of art. 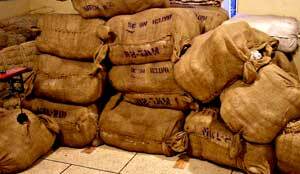 The raw carpet from the handloom is treat with chemical was and put to sunlight to dry. After drying fully, the pile is cut with scissors on suitable pile heights to give the design clarity and reflect shine with light. The carpet at this point is ready to get to finishing depts. like edging, stretching, fringes and final make up. The washing of the carpets coming from the handlooms is difficult one because of the control on the strengths of the chemicals used on every area of the carpet. The carpet can be made look better or just dull in this washing process. 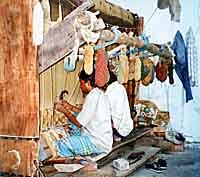 The final adjustments of the knots if required being made by the labor in finishing dept.